Mask is about pampering yourself for that extra boost of benefit to your skin care regime! When it comes to skincare I love finding the ones that helps brighten my skin. I have a yellow pale skin which can sometimes be describe as dull. 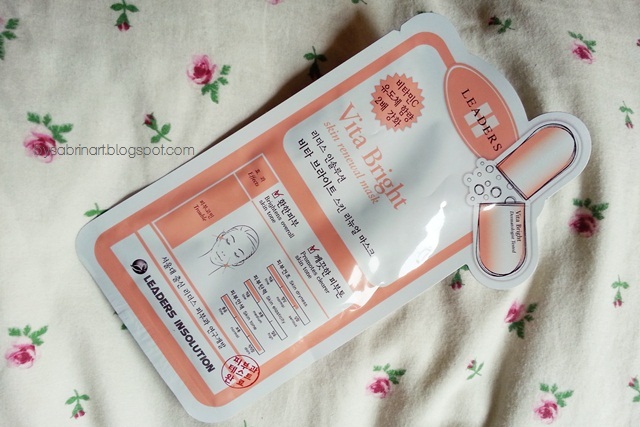 I give this mask from Cathyjoy a try. This mask is from Leaders Insolution brand. I bet you all know this brand that is famous of its mask. When I open the mask, you can see on the second picture. The mask its not made out of the ordinary cotton type of sheet. Am i saying it right? LOL! Its kinda like a "grid-ed" soft material that kinda hold all of the product in it. Applying on the face was not a trouble. The mask fits perfectly on m face and suprisingly it cover my eye area too. Nice! It has a lil cooling effect on my skin. You can see my before and after picture up there. I forgot to wear hijab on the first and second picture so i have to cover it with some "technology". Haha. Mind the bare face with no makeup. Especially the eyebag. Hehe. My skin is very dull even after cleansing. I find that this mask moisturize my skin and does makes my skin glow a lil bit. The product was quite wet when I removed the sheet, but then, i massage it and it absorb in my skin well. To my surprise it makes my makeup application much more easier. My skin does not get cakey fast the whole day. You can get this mask at Cathyjoy.com . They also having a promotion on their Beauty Clinic MEDIHEAL masks in store. Purchase 5 type of mask at RM39.50 only (Original price RM44.50). Click here! And don't forget to use this code - 8868 for additional 10% of your purchase for all Leaders Insolution Mask (ends 31 May 2013). Looks good. I like face masks of all kind. it is! i also love peeling mask for detoxifying! sad ..it is not available here. you can check out online stores!